Every once in awhile I read a book that is so captivating I feel compelled to go back and read it again and again, eventually locating it on the top section of my book shelf for further reference. Invariably I end up giving it away to someone, and have to purchase a Kindle copy to ensure I will always have it on hand. 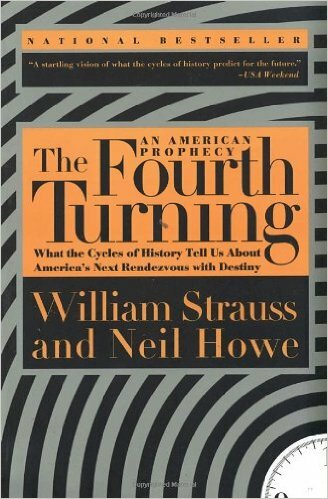 The Fourth Turning by William Stauss and Neil Howe is one of those books. Amazing read. These two men deserve a Pultizer Prize for their research, insight and simple genius. If you are a history buff like me, you will love this book. If you are into biographies, you will love this book. But that is just the starting point. The real secret sauce of The Fourth Turning is in the uncanny patterns that emerge. The book was published in ’97, and the authors warned at that time that we were on the verge of entering another Fourth Turning.